trackscotland.co.uk :: View topic - STOCK CLEARANCE! Thu May 12, 2016 10:36 am Post subject: STOCK CLEARANCE! There is only limited stock of this available, so get your orders in quick - once it's gone, it's gone! You can find it HERE. 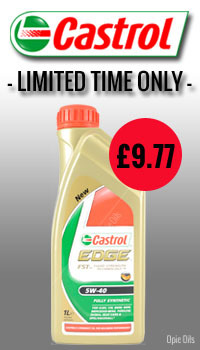 If you need a quick top up before setting off on a long drive, then this 1 litre offer is perfect for you - it's worth having the peace of mind that your oil levels are where they need to be before hitting the motorway. It's also good to know that you've got a top of the range, fully synthetic 5w-40 in there that adapts to your engines every need, even under the most severe pressures - another bonus of using Castrol Edge. Edge 5W-40 is a synthetic technology lubricant suitable for use in petrol and diesel engines where the manufacturer recommends API SM/CF, ACEA A3/B4, ACEA A3/B3, ACEA C3 or earlier specifications. It is formulated to be compatible with modern exhaust after treatment devices and 3 way catalysts and is approved by a wide range of vehicle manufaturers. This features what Castrol call "Fluid Strength Technology" - A dynamic system that actively strengthens the oil, and responds to the level of protection that your engine requires. For our full range of discounted car products, have a look HERE and keep an eye out for special offers, promotions, competitions and other Opie Oils related news HERE. Remember to use your club discount to get that additional 10% off!